Both teams are unbeaten and have been near the top of the D2 polls for the entire season, MSU being top ranked and Ferris right behind them at number 2. 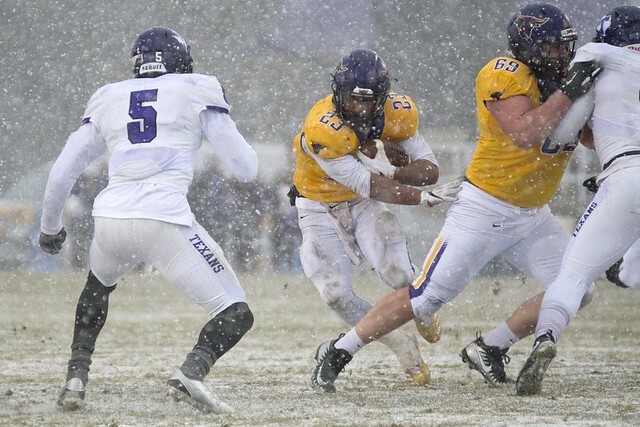 A week ago the Mavericks outlasted Tarleton State 13-10 in a snowstorm in Mankato. 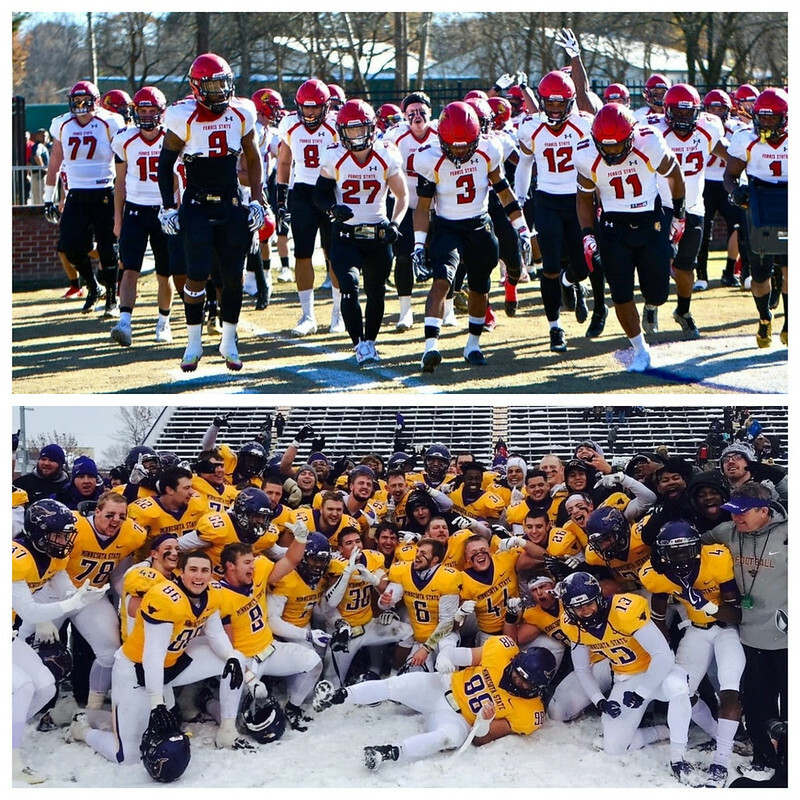 Ferris State made the trip down from Northwest Michigan to Arkansas to battle Ouachita Baptist, handling the GAC Champions 37-14, after jumping out to 27-0 at the break. The Mavs have also beaten Colorado State Pueblo after having a bye the first week, while FSU beat Harding in the first week of the playoffs and then Northwest Missouri State the next. Unlike a week ago, the weather shouldn’t impact the visitors much one way or the other seeing as they’ve played in snow yearly and are a run-based team from the upper Midwest. Earlier in the year the Bulldogs of Ferris won a national title in Men’s Basketball. They are now looking for the very rare Basketball and Football titles in the same calendar year distinction. The Bulldog offense centers around their athletic signal-caller Jayru Campbell. The FSU Junior rushed for over 1,000 yards and has thrown for 24 scores and rushed for 20 touchdowns as well. The Harlon Hill Finalist has a complicated story, having been a Michigan State Spartans commit in High School where he led his Detroit-area squad to a state title as a freshman. The 6’5 200lb quarterback then got in trouble during 2 brushes with the law due to physical altercations, eventually landing him in jail. After that point in time he ended up in Kansas at Garden City Junior College, where he led them to a JuCo Natty. His road back to redemption has now taken him back to Michigan and to Ferris State. Per the Ferris coaching staff is Jayru is a changed person after going through a fair amount of self-induced adversity and change, now being a leader with this Ferris squad. Considering how Campbell has won anywhere he’s gone it should be no surprise the Bulldogs are 14-0 and 2 wins away from a national title. The Bulldog offensive is essentially a zone read rushing attack led by Campbell’s dual threat abilities and they spread the rock with a host of ball carriers, including a familiar face in former 800-yard Upper Iowa rusher Derrick Portis who transferred to FSU after the 2016 campaign. Like the MSU O-Line, the FSU front gets after it and opens a lot of holes for their ball carriers. Campbell will look to run often from his quarterback spot, having amassed 20 plus carries on 5 different occasions this season during their highest contested games. That said, Campbell dinged his shoulder during their first-round contest with Harding and sat out the following game against NWMSU. Shockingly the Dogs put up over 600 yards of offense with former starter Travis Russell against NWMSU. Russell is a very capable backup for FSU as he’s able to make plays with his feet and through the air, offering the Bulldogs a sense of security if their star quarterback went down. The Bulldog don’t have a go-to target in the passing game but do have a group of younger wideouts who can make plays. The Ferris D is quick to the ball and very good, but not outstanding against the run. The Bulldogs have always been known as more of an offensive squad, but the FSU defense is starting to change that perception when considering the strong schedule they’ve played and the lower point totals they’ve allowed. The Bulldogs will come out in a 4-man front and can be had a bit downfield. The Mavs offense has a great 1-2 punch with star ball-carrier Nate Gunn (1,556 yards and 21 touchdowns) and wideout Shane Zylstra (1,083 yards, 14 touchdowns), paired with an offensive line that’s really been the MVP for MSU during the postseason. A week ago the Mankato O-Line won a fight-fight in a phone booth against a very good and physical Tarleton squad. Their ability lead Nate Gunn to 261 yards on an amazing 50 carries speaks volumes to the toughness and grit of the Mavericks. However, MSU struggled yet again in the passing game as they completed merely 8 passes of 23 attempts, with 2 interceptions. The 2-quarterback system of the Mavs hasn’t seen postseason proficiency and the Mavs have needed to rely on the running game and a stout defense to win them games. The MSU defense was strong during the regular season and has looked outstanding during the playoffs. The 4-2-5 defense the Mavs will employ really has stuffed the run but puts the back half in man coverage a fair amount which puts them a risk against more athletic wideouts. A week ago, MSU had challenges staying with the TSU pass-catchers but the windy conditions during the game made it difficult for TSU to connect. Once the snow began the chances of getting on the same page in the passing game became extremely challenging. 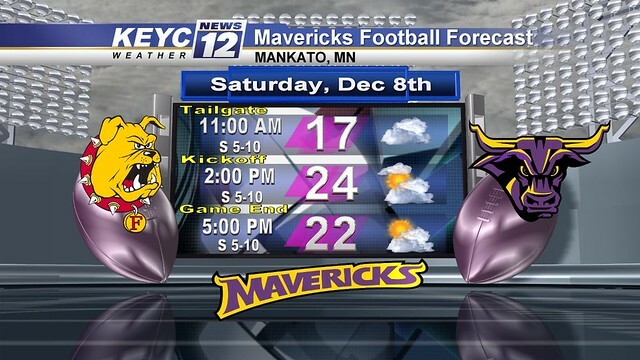 It looks like the weather is going to be cold but with less wind than the previous weeks at Blakeslee Stadium. There is no snow in the forecast, so the weather should look much like the first half against Tarleton but with less of a breeze. Those conditions should enable both teams to execute their offense without the weather being a factor. A challenge the Mavs have run into this postseason is being dynamic offensively. For the most part points haven’t been easy to come by and MSU has needed to grind out first downs and battle in lower scoring games. Ferris on the other hand has looked a bit more explosive offensively and has seen more chunk plays. 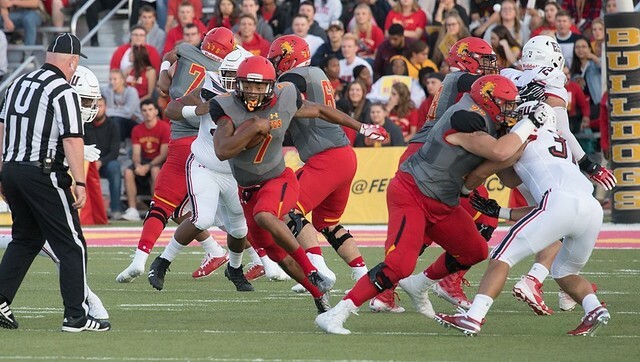 The Mavs have seen success almost entirely with the running game, but Ferris has mixed the run with the pass and doesn’t live between the tackles in the running game like the Mavs. So, there’s a fair amount different about the two offenses even though both squad prefer the ground and pound. Ferris is a little more diverse and likes to get outside in their running game while Mankato likes to run power. Overall, I think MSU will have some success on the ground against FSU but will not able to rely entirely on the run and will need to have some real success in the passing game to advance. This is where I think MSU will struggle and I’ve said it before, but I just don’t think the Mavs can win a national title if they continue to get the quarterback play they’ve gotten. The twin-quarterback system of the Mavs will need to be more efficient and not turnover the ball and miss downfield targets in the way they have in the postseason. This was the same issue MSU had a season ago. Considering how big (6’5,200lbs) and athletic Shane Zylstra is, I’m having a hard time understanding why more jump balls aren’t being thrown his way. Several times during the last few weeks the Mavs signal-callers have been overshooting the star wideout by 5-10 yards, not allowing him to make a play on the ball. On the other side of the ball I’d expect the Mavs to limit the Bulldog running attack, but I think the FSU signal-caller is a unique weapon offensively in the way he can tuck and run with the football. Campbell will make the Mavs defend all 11 players every down and focus on quarterback runs in a way that’s simply much different than any such ball carrying quarterback in the NSIC. Campbell is a capable but not great ball-thrower, but the Dogs like to take shots to the deep post and that’s a bit of a trouble spot for the Maverick D against athletic wideouts. FSU has a good offensive line and their ability to keep their quarterback clean will have a lot to do with outcome of this contest. The Mankato front four gets to the quarterback often but it was apparent a week ago that the Mavs are susceptible to quarterback scampers when coverage is strong. This is seemingly the biggest fear I’d have as a Mavs fan, seeing Campbell get loose as the secondary is running with wideouts down the field. Those type of plays could be especially dangerous for the Mavs as the FSU QB can take some daylight and turn it into a long score. Mankato is certainly better in the kicking game and Casey Bednarski could be a key factor in this game if the teams stall in the red zone. Bednarski missed on his one attempt a week ago, but with Ferris only making 7 of their 18 attempts it’s apparent that MSU has an advantage if the game becomes a field goal contest. A week ago, once the TSU vs MSU game wrapped up, I thought that if Tarleton played Mankato on a dry field under normal conditions that the Texans would’ve likely won the game. I continue to say the Mavs are a more physical team than the Texans and they were able to impose their will when the conditions got wet and snowy. This week I think conditions are much closer to normal, for both teams, than the snow game of a week ago. With that, I think the defenses are similar in this matchup with a slight edge to MSU. 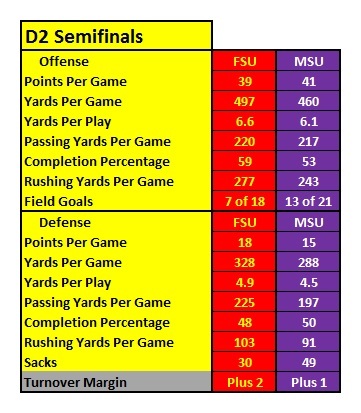 However, I think the Ferris State offense will be hard to keep down and the Mavs offense just hasn’t produced enough in the passing game against playoff competition for me to take MSU in this one. My heart says the Mavs, but the objective columnist says Ferris State.